If there was a Cobra character that just screamed “cool” it was Destro. Maybe it’s just the influence of the voice casting in the Sunbow cartoon with the “Barry White” smoothness pervading his every word. Or, perhaps it’s the characterization that Larry Hama gave the character in the Marvel Comics series—noble, honorable (to a point), and cunning. 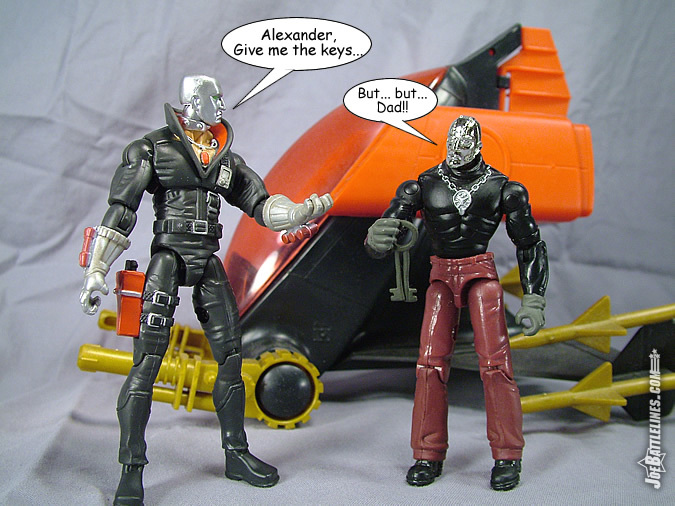 Either way, Destro was “the man” when it came to the Cobra hierarchy and there was no denying that he was a fan-favorite for many a young Joe fan. As such, it seemed only logical that Destro be included in the premiere boxed set of the brand-new 25 th Anniversary line. Now, after my experiences with the GIJoe figures in this line I was dubious when it came time to release James Cullen from his plastic prison. Yet, the Laird had a few surprises in store for me that assuaged my fears—somewhat. 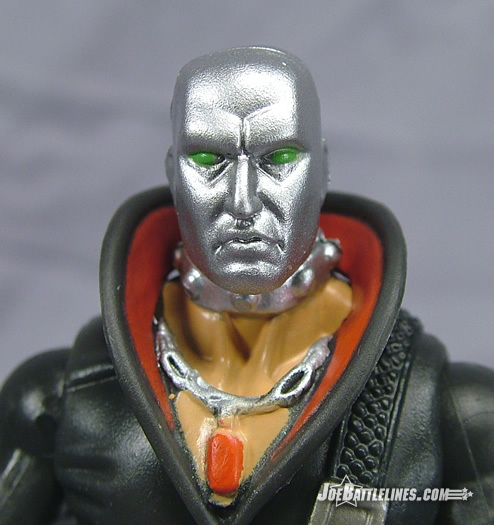 Destro’s head sculpt reminds me quite a lot of Destro bust that was released by the now-defunct company Palisades a few years back. (A heart-felt moment of silence for their passing. Palisades put out some fantastic product and their presence will be missed in the toy world.) 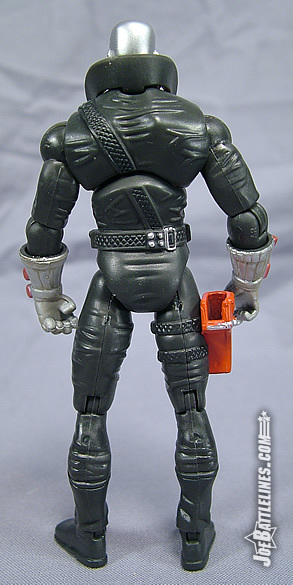 That particular piece of statuary featured Destro with the large bolts around the base of the mask and very piercing green eyes—two aspects which this character design also possesses. Personally, I like the bright green eyes—which either could be perceived as high-tech lenses or James McCullen’s own distinctive gaze. 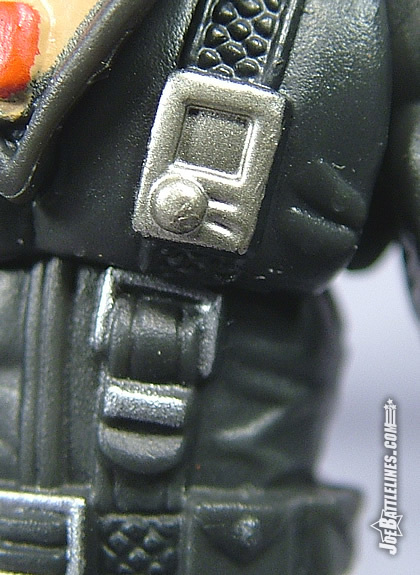 My only grievance with this head sculpt, and really all Destro head sculpts starting with the v3, is that it is just ever too small to contain a human-sized head. 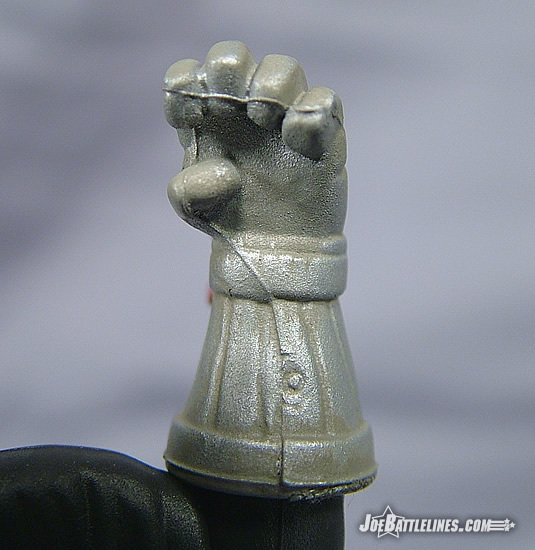 As I mentioned in the Cobra Commander review, Hasbro started sculpting the masked heads to be the same size as uncovered human heads which means that Destro must have a noggin the size of Roadblock’s inside this mask. It’s a minor detail and one that has been ongoing for decades now but it means that Destro is slightly “pin-headed” as a result. His mask is detailed, very much like the Palisades bust, to resemble a human head—complete with a slight facial expression. 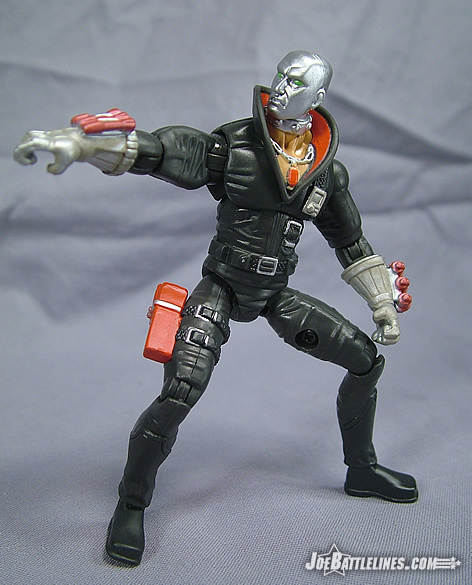 Whereas the v1 version of Destro went with a very “metal mask” design, this is once again more in line with the cartoon appearances of Destro which depicted his head a more of a silver face. 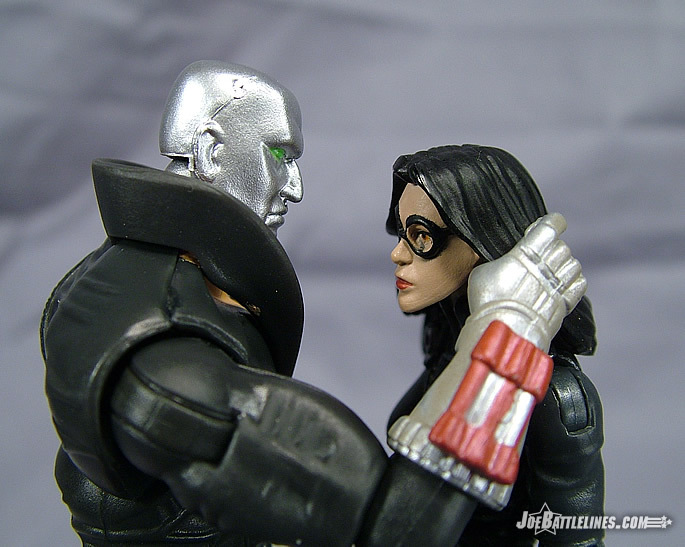 Still, it works for Destro and that’s fine by me. 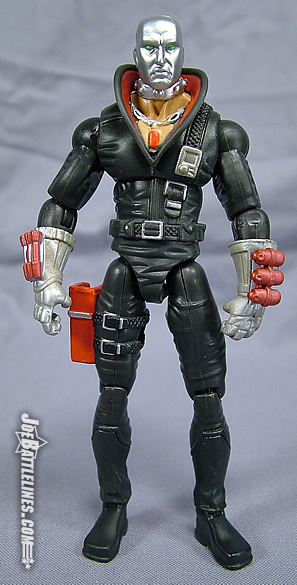 Like the other figures in this line, Destro is equipped with a figure stand bearing his name and allegiance as well as a replica of his original file card. 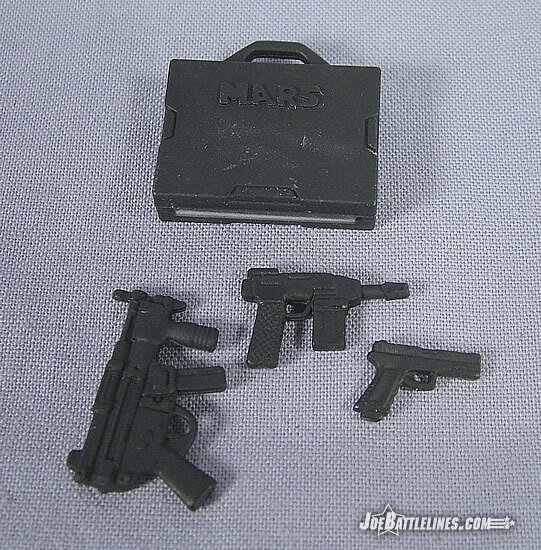 Also included with the figure are an SMG (previously seen with the VvV wave 7 Duke), a small pistol, and a brief case that contains more than a few surprises. 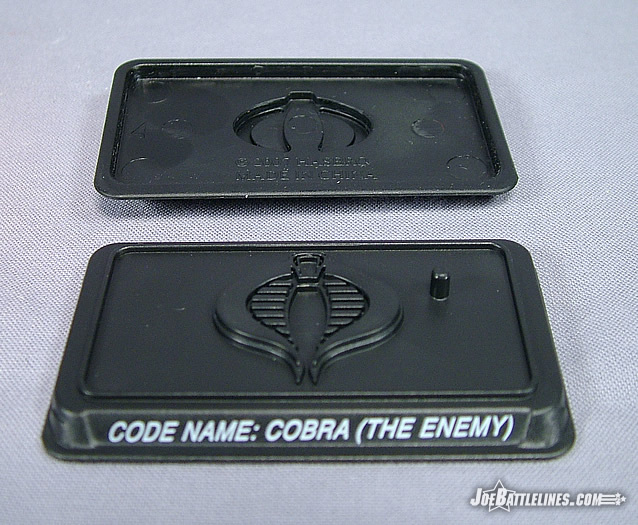 The original Destro was packaged with a brief case which opened to reveal several molded weapons. This version, refusing to be outdone by his predecessor, takes things a step further. 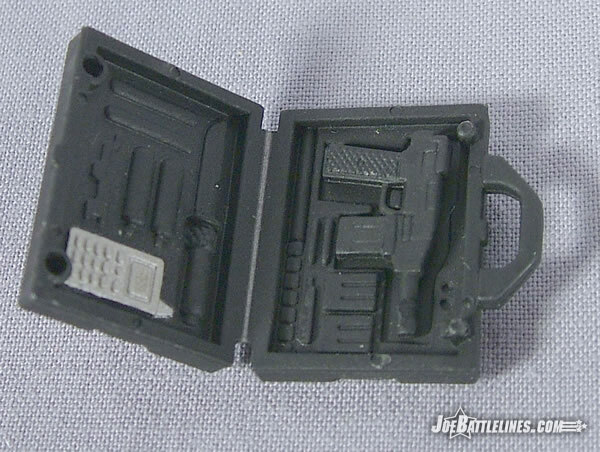 Yes, the molded weapons are still sculpted inside the pack but the automatic pistol show to the right in the photograph is removable! (In fact, it’s kind of a pain to get back into position once it’s removed!) 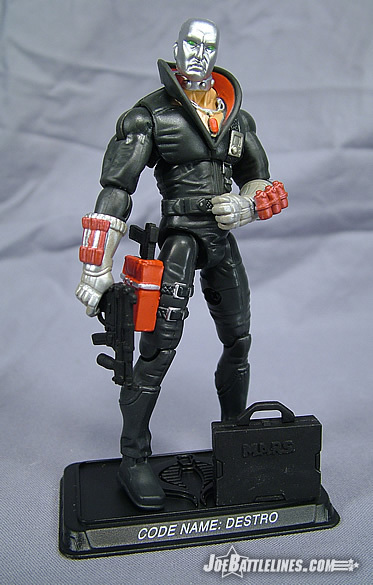 This is a fantastic inclusion in the design and one that made me as giddy as I was back in 1983 when I first received the original Laird Destro figure. The rest of case is nicely detailed— and the inclusion of a MARS logo on the outside is particularly great—but the removable weapon seals the deal for me. It’s just too bad that he cannot hold the case in his sculpted left hand. I don’t know what happened between “design” and “production” but something certainly occurred in the left hand of Destro. I’m not certain whether it’s the shape of the figures or the position of the thumb but this hand is completely incapable of grasping the handle of attaché. 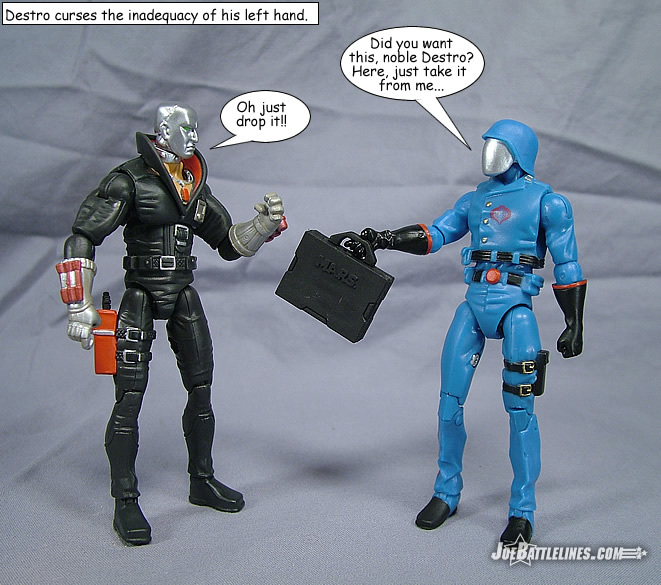 As a result, if Destro is carrying a weapon in his right hand he’s got to leave his case lying on the floor nearby. 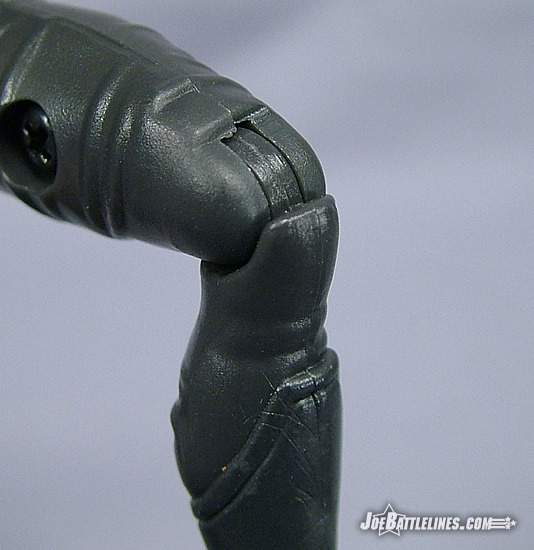 Now, I can understand the closed left fist on the Cobra Commander figure—he’s only got one accessory to contend with and it is either worn on his back on carried in his right hand. 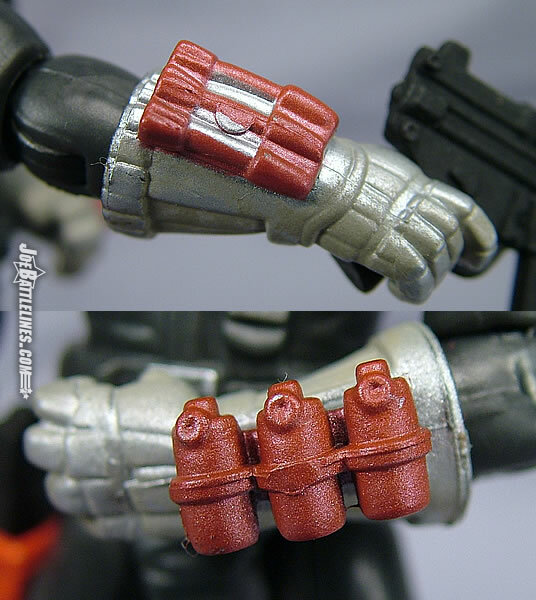 Destro, however, is equipped with panoply of accessories and so this “gimp grip” proves rather unfortunate. It’s really the only downside of this figure that, possessing standard knees, is not plagued by the “sitting issues” of his compatriots in the set. For some reason, Hasbro just can’t seem to nail down the perfect figure in this series and always seems to include at least one design flaw to bring the “25 th euphoria” back into perspective. However, aside from this issue, I have to say that Destro just might be the best figure released in this series so far. 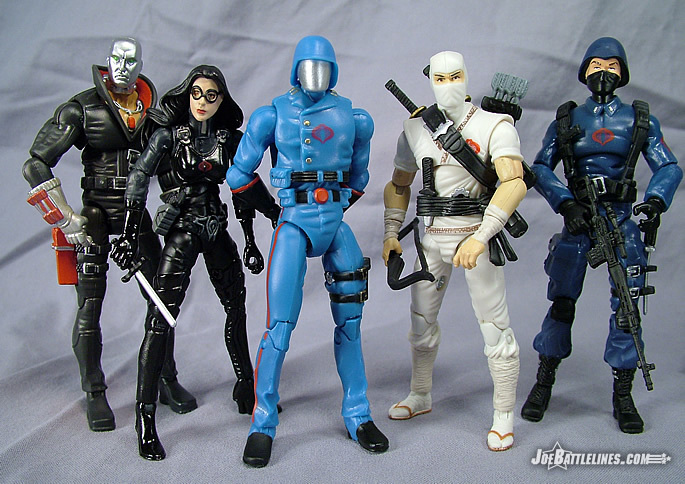 If the entire 25 th line was constructed and detailed like Destro, Hasbro would have a real hit on their hands. He’s a solid update that moves and poses like the classic figures that the line is based upon. 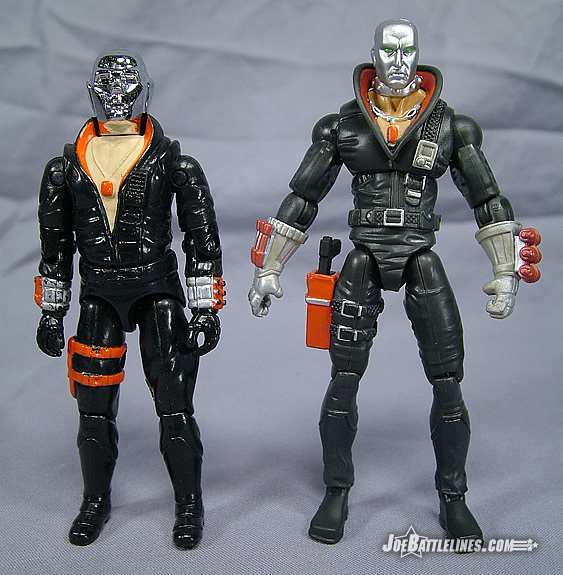 Between a faithful character design and some extra new details, Destro espouses the true potential of what Hasbro could achieve with the “A-game” devoted to his line. Issues like the left hand aren’t enough to diminish my enjoyment of the figure—but they do issue that “cold water” reality check. This line isn’t perfect and it’s got a ways to go if it is to ever hope of surpasses those that came before it. Still, if more figures follow in the footsteps of Destro rather than in those of Duke, Gung-Ho, and the Baroness this line just might succeed in winning over this particular Joe fan. 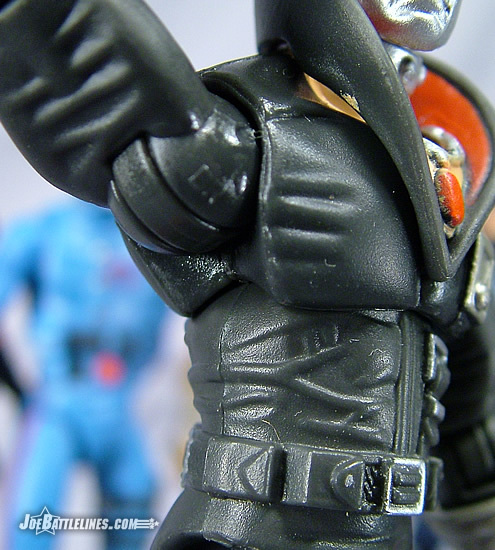 Destro is the best-of-the-best and one that many fans are going to want to purchase, display, and enjoy and he’s a worthwhile addition to any collection.